This week we have an audio book review of Roses in the Tempest by Jeri Westerson. We also have a fun interview with Jeri. Details at the end of this post on how to enter to a copy of the audio book, and a link to purchase it from Amazon. March 1551: He enters the darkened room for a final visit. She lies on the bed her arms placed upon her chest with her rosary cross. He kneels, cries softly, and wishes that one summer, only one of the summers could have been changed. First Summer, 1515: Isabella Launder, daughter of a yeoman farmer, finds pleasure in her solitude tending to her garden, her roses, and the family farm. Her one diversion, the friendship she has with Sir John Giffard’s son Thomas, began a few years earlier when he, on his horse, knocked her into the mud. They spend afternoons in debate and honest discussion without the confines of class; both find pleasure in each other’s company. However, it is not enough to cross class lines. Thomas is set to marry for property and for wealth, and Isabella, deemed a distraction to Thomas’s obligation, decides she is better suited for the priory than marriage. Another Summer, 1521: Thomas Giffard has become a regular at court witnessing and often entering in debate about the events that plague the issues of royal succession. He complies with that which society dictates for his marriage, siring a daughter and supporting his wife, but he relishes the visits with Dame Isabella at the Black Ladies’ Priory. Dame Isabella has an unexpected change in her position at the priory, and although she has resigned herself happily to the life of a nun, she ponders her deep feelings for Thomas and looks forward to his visits even though the propriety is questioned. She contends with interesting personalities, jealousies, and the continued struggles for self-sufficiency at the priory. More Summers, Autumns, Winters, 1526-1540: Thomas Giffard and Isabella Launder struggle to find their own way and to deal with, if not survive, drastic changes in the religious landscape. After Henry VIII splits from the Catholic church, he anoints himself the head of the Church of England and demands all take the oath to uphold the Act of Succession, a refusal for conscience is deemed treason and met with severe consequences. Thomas has his family and great wealth to protect; Isabella has her deep faith and her priory sisters to protect. Taking the oath to forsake others and support the King proves to be difficult at best. Chapter 30, Thomas Gifford, March 1540. Jeri Westerson’s “Roses in the Tempest” is an epic adventure spiriting you back to the days of Henry VIII and Tudor England. Each chapter opens with a quote that best illustrates the perspective of Isabella Launder, then of Thomas Giffard, then Isabella, then Thomas… The conversations, some open, some discreet, seem to be exactly what would have been discussed: politics and religion, family obligations and life-long vows, sides taken between the King’s desires, the country’s best interest, and one’s conscience and faith. Welcome to KRL, Jeri! I thoroughly enjoyed the audio version of your book Roses in the Tempest, and although I know much of the history behind the story ? I saw Anne of a Thousand Days a zillion times ? I was still googling names and places to better understand the history in the fiction. KRL: What inspired you to write historical fiction? This book shares with us life and mores of sixteenth century Tudor England, but your Crispin Guest Medieval Noir series takes us back even farther into fourteenth century history. What interested you about these eras in which you set your stories? Are you channeling a previous life or two? Jeri: As a kid, I was raised in a household that liked to submerge itself in medieval England. My parents had books of fiction and non-fiction on the shelves at home and I read a LOT. Conversations at the dinner table revolved around the British monarchy, so it was a big thing. When I decided, after a career as a graphic designer, to become a novelist, it was naturally going to be historical novels. But after some ten years of writing the kind of historicals I wanted to write (about ordinary fictional people in extraordinary circumstances), I had discovered that editors weren’t interested in publishing them. Still, this kind of historical writing translated much better into historical ‘mystery,’ and so that’s what I ended up doing; developing a medieval mystery series, my Crispin Guest Medieval Noir series, and that’s what ended up finally getting published. 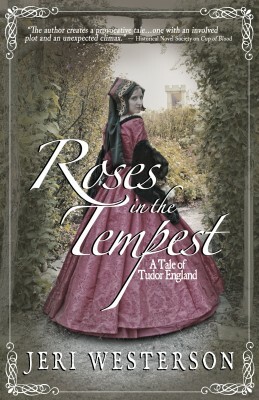 Roses in the Tempest was one of those many books I wrote in those years of trying to get published prior to my mystery writing. I knew that a publisher wouldn’t know what to do with it, even though this time everyone in the story really did exist. KRL: It was fascinating reading, well listening to, the story about Henry VIII and the intrigue and turmoil of succession. What kind of research did you do to weave the real with the story? Have you been to England for some on-site exploration? Jeri: I have been to England, but it’s been too many years ago; one of the places I went was Hampton Court. I knew far too much about Henry VIII even as a kid. For this particular book, it began with a question; after Henry VIII dissolved the monasteries, what happened to all those poor nuns? Perusing the list of dissolved monasteries, I came upon a very small one in Brewood called Black Ladies. In the early days of the internet, I found the Brewood village website and read up about their former convent, contacted the webmaven in England, and struck up an email friendship. She got me in touch with the local historian who wrote the book about the area ?which really helped me with the minutia of the research I would need ? and embarked on what was, for me, a new venture of telling a true tale from start to finish, with flourishes of fiction. There was a lot of haunting university libraries for the books I needed for the rest of the research. And all this for a book that I never expected to be published. It was only years later when self-publishing became viable and I already had a following with my Crispin Guest series, it seemed like a good idea to take it from “the vault” and publish it myself. 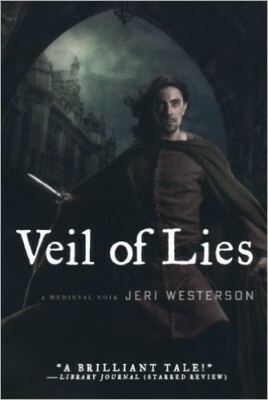 KRL: Your Crispin Guest Medieval Noir series has nine books starting with your October 2008 publication of Veils of Lies. Tell us about the series background and the main character, Crispin Guest. Jeri: Crispin Guest was my idea of a breakout character from the typical medieval mystery, a hardboiled detective set in the medieval era. Well, he didn’t break out as much as I hoped he might, but it’s still a critically acclaimed series with 12 national award nominations under its belt, and with enough worldwide readers to keep it going. It’s also available in Russian, Polish, French, and Italian. I styled him after the hardboiled detectives of the 30s and 40s, a medieval Sam Spade. A hard drinking, hard fighting, hard living tough guy who’s a sucker for a dame in trouble. The kind of man with a chip on his shoulder, and in order to make him that way, I wanted a different kind of protagonist from your typical monk or nun medieval detective. I wanted him to be a man people actually hired. I wanted a knight, a man used to fighting, who could speak several languages, and who could use his nimble mind to solve crimes. But in order to be the angry individual I wanted, I had to take everything away from him, all that defined him: his lands, his wealth, his title. He committed treason for a good cause, but was going to lose his life in the worst possible way to the boy king Richard II for essentially trying to overthrow him for his mentor and father figure, John of Gaunt, the duke of Lancaster. Lancaster pleaded with his nephew the king for Crispin’s life, and that was all that was spared. He was banished from court and set adrift on the streets of London with nothing but the coat on his back and his wits. He reinvented himself as the “Tracker,” my idea of a medieval detective. And just to throw something else into the mix, he always finds himself involved in some sort of religious relic or venerated object, a sort of Maltese Falcon that is either central to the plot or something periphery. KRL: Your website shows two paranormal books. Tell us about Book One in the Booke of the Hidden Series, a “quirky-humorous yet edgy-romantic urban fantasy set in a small town in Maine” and Book One of the Conjurer Chronicles The Daemon Device, a “paranormal steampunk series set in Victorian England.” When might they be available to us? Jeri: Well, Booke of the Hidden is schedule for release November 2017. My agent and I discussed where my career might be going, and I suggested that I’d like to write some paranormal books. I was always reading sci-fi and fantasy in high school and college, so I feel a bit as if I’m getting back to my roots. I literally dreamed the plot of the first book in the Booke of the Hidden series, complete with names of characters, and what Kylie, my female protagonist, had to do. She moves from California to a small town in Maine to open an herb and tea shop and finds a mysterious book bricked up in the wall. The moment she opens it she releases demonic creatures into the world and sets something in motion that she must now set right. With the help of the local misfit Wiccans and a handsome demon from the book, she begins her quest to save the world and the village locals from destruction. It’s a five-book series. The Conjurer Chronicles came from my love of steampunk, as Jules Verne and H.G. Wells wrote it, though they didn’t realize they were writing it. Airships, Victorian gentlemen, paranormal happenings, and an alternate history, England powered by steam, had a lot to recommend it. But what mostly interested me was the Houdini era world of magic and magicians. And so in the first book, The Daemon Device, we are introduced to Leopold Kasimir, a Jewish/Gypsy magician who really can do magic…for a price. He’s friends with a Jewish daemon who helps him perform his magic, and a mysterious automaton who’s alive. Jack the Ripper might also be on the loose again with a mysterious and beautiful Special Inspector from Scotland Yard who wants to find him…or is she part of the horrendous plot of the Daemon Device? It’s hella fun to write, and my agent is shopping it now to a publisher. It’s a trilogy, though if it sells well, I can plan more arcs with more trilogies, like a comic book/graphic novel. KRL: What can we expect from you in the future? Is there another era in English history you hope to explore? Arthurian…Jacobean…Elizabethan…? Or will you depart to something contemporary? Jeri: Well, I already write the Skyler Foxe LGBT Mysteries under the name Haley Walsh. Those books are contemporary romantic comedies, but I am also considering a new mystery series set in Henry VIII’s court. Everything I’m writing right now is keeping me busy so that can certainly wait. KRL: I am one of your Facebook Friends and am so curious by your Profile Photo. Tell us more about you and the medieval armor. There certainly must be a delightful story to share about that experience. Jeri: Well, it was actually for a magazine shoot. That armor is borrowed, it’s not mine. But it’s all part of my hands-on research that I’ve done for my medieval novels. I’ve been in other armor riding a 2,000 pound Percheron warhorse, with a lance in my hand, getting the feel of the experience. So with writing these books comes a lot of excuses to have these experiences and to collect my own cache of medieval weaponry that I bring with me when I do my book launches and other events. KRL: What is something people would be surprised to know about you? Is there a hobby or interest you have beyond writing? Jeri: I used to do wood carving. And I made birdhouses to sell when I worked in a local winery. That’s when I had more free time. Since I write full time now (and as you can see from above, I have quite a few series going at the same time) there just isn’t enough hours in the day. KRL: This has been great fun getting to know more about you. Is there anything we have forgotten to mention? Jeri: My website is chock full of interesting things. Crispin has his own blog, and each Crispin Guest novel has a discussion guide for book clubs. 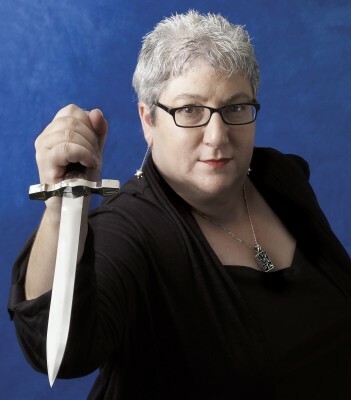 And by the way, if you’re local to me in the southern California area, I happily visit book clubs to give a talk, and I bring my medieval weaponry. If you aren’t local, I’ve been known to Skype, so give me a shout at my email address which you can find on my website. And thanks for having me here. History is Real – Google it! To enter to win an audio book copy of Roses in the Tempest, simply email KRL at krlcontests@gmail[dot]com by replacing the [dot] with a period, and with the subject line “roses,” or comment on this article. A winner will be chosen December 24, 2016. If entering via email please include your mailing address, and if via comment please include your email address. Kathleen Costa is a long-time resident of the Central Valley, and although born in Idaho, she considers herself a “California Girl.” Graduating from CSU-Sacramento, she is 35+ year veteran teacher having taught in grades 1-8 in schools from Sacramento to Los Angeles to Stockton to Lodi. Currently Kathleen is enjoying year 3 of retirement revitalizing hobbies along with exploring writing, reading for pleasure, and spending 24/7 with her husband of 26+ years. What an interesting author – thanks for offer! Sounds really good!